We believe that eating fresh, high quality food, locally grown whenever possible, should be the first dietary priority in every person's life. However, it appears to be very difficult, if not impossible, to meet our needs by diet alone. Supplementation in addition to a healthy diet and lifestyle becomes more and more advisable, if not a necessity. ABC-of-Vitamins does not sell any products but will recommend products we believe are of value to our readers. We recommend the following products because they are of highest quality and the most effective nutritional supplement we have ever tried. Follow the links below to find out more about these products and purchase them directly from the manufacturer. For all product questions and concerns you can contact us. Buy the Wellness Pack for U$106 plus shipping or have it delivered automatically, each month with free or reduced shipping! 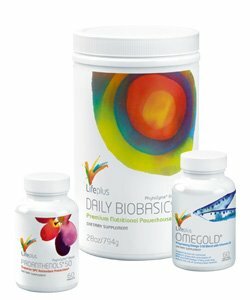 All LifePlus nutritional supplements are purchased and shipped directly from the manufacturer and backed by a 30-Day 100% satisfaction guarantee. Buy the Body Detox and Cleansing Pack for US$ 74.50 plus shipping. 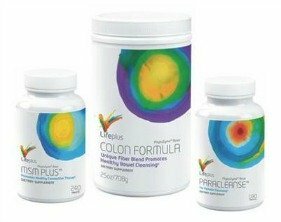 Colon Formula is a unique proprietary blend of different high-quality soluble and insoluble fibers, along with valuable herbal concentrates, and a synergistic blend of beneficial microflora (probiotics) to help maintain healthy colon ecology and intestinal acid-alkaline balance*. MSM Plus™ represents a highly bioavailable source of sulfur, a mineral element critical to the normal function and structure of the body*. Paracleanse™ is a synergistic combination of herbs, herbal extracts, sulfur-containing amino acids and MSM, carefully designed to support healthy cleansing of your system*. Please note that this website is maintained through commissions made when you buy through any of its links.